Nissan Motor Company, Ltd. shortened to Nissan is a multinational automaker headquartered in Japan that manufactures automobiles, trucks, buses, and products such as communications satellites, pleasure boats, and machinery. The name "Nissan" came into use during the 1930s as an abbreviation used on the Tokyo stock market for Nippon Sangyo, a holding company founded by Yoshisuke Aikawa (鮎川 義介, 1880-1967). In 1931, Aikawa acquired a majority of shares in the automaker DAT Motors. Aikawa merged Tobata Casting's automobile parts department with DAT Motors and incorporated it as a new subsidiary, which he named Nissan Motor Co., Ltd. In the 1950s, the management of Nissan made a conscious decision to expand into worldwide markets, realizing that its Datsun small car line would fill an unmet need in markets such as Australia and the United States. By 1970, Nissan had become one of the world's largest exporters of automobiles, continually improving on its technology and adding sporty cars to its line. By entering into partnerships with Austin and Ford, and creating subsidiaries and manufacturing plants in other countries, Nissan established itself as a major international automaker. In 1999, facing severe financial difficulties, Nissan entered an alliance with Renault S.A. of France. Renault appointed its own Chief Operating Officer, Carlos Ghosn, as Chief Operating Officer of Nissan. Under Ghosn's "Nissan Revival Plan" (NRP), the company has rebounded in what many economists consider to be one of the most dramatic corporate turnarounds in history. The auto works changed its name in 1918, to Kwaishinsha Motorcar Company, and again in 1925, to DAT Motorcar Company. Nissan Model 70 Phaeton, 1938. At that time there was almost no consumer market for the DAT and Datsun passenger cars, so DAT Motors began to build trucks. In 1918, the first DAT trucks were produced for the military market. A low demand for military vehicles during the 1920s forced DAT to merge in 1926, with Japan's second most successful truck manufacturer, Osaka-based Jitsuyo Jidosha Co., Ltd. (実用自動車製造株式会社, Jitsuyō Jidōsha Seikoku Kabushiki-Gaisha), also known as Jitsuyo Motors, which had been established in 1919, as a Kubota subsidiary. The new company, DAT Automobile Manufacturing Co., Ltd. (ダット自動車製造株式会社, Datto Jidōsha Seizō Kabushiki-Gaisha) was located in Osaka until 1932. In 1931, DAT came out with a new smaller car, the first "Datson," meaning "Son of DAT." Later in 1933, after Nissan took control of DAT Motors, the last syllable of Datson was changed to "sun," because "son" also means "loss" (損) in Japanese, hence the name "Datsun" (ダットサン, Dattosan). In 1933, the company name was Nipponized to Jidosha-Seizo Co., Ltd. (自動車製造株式会社, Jidōsha Seizō Kabushiki-Gaisha, "Automobile Manufacturing Co., Ltd.") and company headquarters was moved to Yokohama. 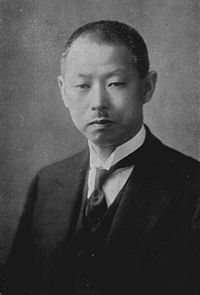 First President Yoshisuke Aikawa in 1939. In 1928,Yoshisuke Aikawa (or Gisuke Ayukawa) (鮎川 義介, Aikawa Yoshisuke, 1880-1967), a Japanese entrepreneur, businessman, and politician, founded the holding company Nippon Sangyo (Japan Industries or Nippon Industries). The name "Nissan" came into use during the 1930s, as an abbreviation used on the Tokyo stock market for Nippon Sangyo. Nippon Sangyo was the famous Nissan zaibatsu (conglomerate) which included Tobata Casting and Hitachi. Nissan eventually grew to include 74 firms, and became the fourth-largest business conglomerate in Japan during World War II. Nissan controlled foundries and auto parts businesses, but Aikawa did not enter automobile manufacturing until 1933. In 1931, Aikawa purchased a majority of shares in DAT Motors, and in 1933, Nissan merged Tobata Casting's automobile parts department with DAT Motors. In 1934, Aikawa incorporated the expanded automobile parts division of Tobata Casting as a new subsidiary, which he named Nissan Motor (Nissan) Nissan Motor Co., Ltd. (日産自動車, Nissan Jidōsha). The shareholders of Tobata Casting were not enthusiastic about the prospects of the automobile in Japan, so Aikawa used capital from Nippon Industries to buy them out in June 1934. From that time on, Nissan Motors was effectively owned by Nippon Sangyo and Hitachi. Beginning in 1938, the company converted entirely to production of trucks and military vehicles. Nissan built trucks, airplanes, and engines for the Japanese military during World War II. After Japan established itself in China, the company's main plant was moved there, and continued to produce machinery for the Japanese war effort until it was captured by American and Russian forces. In 1945, Allied occupation forces seized the main Nissan plants. They allowed production of Nissan and Datsun vehicles to resume at one plant, but other facilities were not restored to Nissan until 1955. For two years, from 1947 to 1948, the company was briefly called Nissan Heavy Industries Corporation. When DAT merged in 1926, with Jitsuyo Jidosha Co., Ltd., it acquired the services of an American engineer, William R. Gorham (1888-1949), who had designed Jitsuyo Jidosha’s first three-wheeled vehicle. Gorham, who renounced his U.S. citizenship to become a naturalized Japanese citizen, introduced an American concept of technological rationalism to the machinery industry in Japan, and helped develop the mass production of Japanese automobiles. In 1908, Aikawa had visited Detroit and been inspired with a vision that was to greatly affect Nissan's future. With Gorham’s help, he carried out his plans to import the latest auto-making technology from America. All the machinery, vehicle designs, and engine designs originally came from the United States. The machinery was imported into Japan by Mitsubishi on behalf of Nissan. From 1993-2002, Nissan partnered with Ford to market a consumer-friendly minivan, the Mercury Villager and the Nissan Quest. The two minivans were manufactured with all the same parts and were virtually identical, aside from several cosmetic differences. In 2002, Ford discontinued their Mercury version of the Nissan Quest to make room for the future Freestar and Monterey. Nissan continued to produce the Quest. In 1992, Nissan re-launched its Patrol four-wheel drive, which was visually and mechanically identical to the Ford Maverick. Both cars were built in Spain, and although the Maverick was discontinued in 1998, due to disappointing sales, the Patrol was a strong seller and remains in production today. Like Hino and Isuzu, Nissan partnered with an established European company to gain access to automobile and engine designs. Nissan chose Austin of the United Kingdom, which later merged with Morris to become the British Motor Corporation. Nissan began building Austin 7s in 1930, though the legitimacy of their license at that time is debated. In 1952, Nissan Motor Company of Japan entered into a well-documented legal agreement with Austin to assemble 2,000 Austins from imported, partially-assembled sets, and sell them in Japan under the Austin trademark. The agreement called for Nissan to make all Austin parts locally within three years, a goal Nissan met. Nissan produced and marketed Austins for seven years. The agreement also gave Nissan rights to use Austin patents in developing its own engines for its Datsun line of cars. In 1953, British-built Austins were assembled and sold, but by 1955, the Austin A50, completely built by Nissan and featuring a slightly larger body with a new 1489 cc engine, was on the market in Japan. From 1953-1959, Nissan produced 20,855 Austins. Nissan used the Austin patents to develop its own modern engine designs, which could out-perform the Austin A- and B-family engines. The apex of the Austin-derived engines was the new Nissan A series engine in 1967. In 1967, Nissan also introduced its new highly advanced four-cylinder overhead cam (OHC) Nissan L engine, which though it resembled Mercedes-Benz OHC designs, was a totally new engine. This engine powered the new Datsun 510, which gained respect for Nissan in the worldwide sedan market. In 1970, Nissan introduced the Datsun 240Z sports car, using a six-cylinder variation of the L series engine. The 240Z was an immediate sensation and earned Nissan a worldwide reputation in the automobile market. In 1966, Nissan merged with the Prince Motor Company, incorporating more luxurious cars, including the Skyline and Gloria, into its range. The Prince name was eventually abandoned, with successive Skylines and Glorias bearing the Nissan name; "Prince" is still used in names of certain Nissan dealers in Japan. Nissan introduced a new luxury brand for the U.S. market in the early 1990s, called Infiniti. In the 1950s, Nissan made a conscious decision to expand into worldwide markets. Nissan management realized that its Datsun small car line would fill an unmet need in markets such as Australia and the world's largest car market, the United States. In 1958, they first showed cars at the 1959 Los Angeles auto show, and sold a few cars that year in the United States. The company formed a U.S. subsidiary, Nissan Motor Corporation U.S.A., in 1959, headed by Yutaka Katayama. By 1970, Nissan had become one of the world's largest exporters of automobiles, continually improving on the technology of their sedans; using chic Italianate styling; and adding sporty cars to their line, such as the Datsun Fairlady roadsters, the sporty and race-winning 411 series, the Datsun 510 and the world-class Datsun 240Z sports car. In the wake of the 1973 oil crisis, consumers worldwide (especially in the lucrative U.S. market) began turning in rapidly increasing numbers to high-quality small economy cars. Nissan made a conscious decision to give their growing economy car lines a "sporting" flavor, and set up new factories in Mexico, Australia, Taiwan, and South Africa. Nissan established assembly operations in the United States in the early 1980s, with a plant in Smyrna, Tennessee. This facility at first built only trucks and SUVs, such as the 720, Hardbody, and Pathfinder, but has since been expanded to produce several car lines. An engine plant in Decherd, Tennessee followed, and most recently a second assembly plant in Canton, Mississippi. To overcome export tariffs and delivery costs to its European customers, Nissan decided to establish a plant inside Europe's borders. Sunderland, in the United Kingdom, was chosen due to the local availability of a highly skilled workforce, and its position near major ports. The plant, completed in 1986, as the subsidiary Nissan Motor Manufacturing (UK) Ltd, has since achieved the highly coveted distinction of being the most productive plant in Europe. The Nissan Note, Micra, and Qashqai in the UK are all produced at the UK factory. Nissan also produces cars at its factory at Roslyn, near Pretoria, South Africa. Financial difficulties in Australia in the late 1980s caused Nissan to cease production there. Under the Australian government’s "Button Plan," or Motor Industry Development Plan, an initiative to make the Australian automobile industry more efficient, the same basic vehicle was sold by several different companies under different names. Nissan products were “re-badged” by General Motors Holden (Nissan Pulsar re-badged as Holden Astra), and Ford (Nissan Bluebird re-badged as Ford Corsair). This sharing of models proved unpopular with buyers, and original models outsold their badge-engineered counterparts. Nissan ended automobile manufacturing in Australia completely in 1994. The name "Nissan" is pronounced differently in different markets. In the U.S., the brand is pronounced /ˈniːsɑːn/, while in the UK it is /ˈnɪsən/. In Japanese, it is IPA: [nisːãɴ]. The Nissan Titan was introduced in 2004, as a full-size pickup truck produced for the North American market. The truck shares the stretched Nissan F-Alpha platform with the Nissan Armada and Infiniti QX56 SUVs. The Titan features a 32 valve 5.6 L VK56DE V8 engine which generates 305 hp, and is capable of towing approximately 9500 pounds. The Nissan Titan comes in four basic trim levels: XE, SE, Pro-4X, and LE, offering different combinations of the features. It was listed by Edmunds.com as the best full-size truck. The Titan was nominated for the North American Truck of the Year award for 2004. Signed on March 27, 1999, the Renault-Nissan Alliance was the first of its kind, involving a Japanese and a French car manufacturer, each with its own distinct corporate culture and brand identity. The same year, Renault appointed its own Chief Operating Officer, Carlos Ghosn, as Chief Operating Officer of Nissan, and took a 22.5% stake in Nissan Diesel. Later that year, Nissan fired its top Japanese executives. Carlos Ghosn, KBE (Arabic: كارلوس غصن; born March 9, 1954), is a French businessman born in Brazil to Lebanese parents and raised in Lebanon. Under Ghosn's "Nissan Revival Plan" (NRP), the company has rebounded in what many economists consider to be one of the most dramatic corporate turnarounds in history, elevating Nissan’s profits to record levels and revitalizing both its Nissan and Infiniti model line-ups. In 2001, capitalizing on the success of the NRP, the company initiated “Nissan 180,” setting targets to sell one million cars, achieve operating margins of 8 percent, and eliminate automotive debts. Ghosn has been recognized in Japan for the company's turnaround in the midst of an ailing Japanese economy; Ghosn and the Nissan turnaround were featured in Japanese manga and popular culture, and his achievements in revitalizing Nissan were noted by Emperor Akihito, who awarded him the Japan Medal with Blue Ribbon in 2004. As an outsider in charge of one of Japan's largest companies, Ghosn has been successful. He was voted Man of the Year 2003 by Fortune magazine's Asian edition and is also on the boards of Alcoa, Sony, and IBM. Ghosn became CEO of Renault, Nissan's partner and shareholder, in 2005, succeeding Louis Schweitzer, while remaining CEO of Nissan. The Renault-Nissan Alliance is a unique arrangement of two global companies linked by cross-shareholding, with Renault holding 44.3 percent of Nissan shares, while Nissan holds 15 percent of Renault shares. The first product of the Nissan-Renault alliance was the Nissan Primera, launched in 2001, and based on the Renault Laguna that had been launched in 2000. Subsequently, Nissan's Micra, Note, and Versa models have shared the same mechanical design as the Renault Clio. 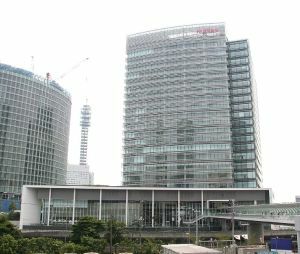 Nissan's main offices are located in the Ginza area of Chūō, Tokyo, but Nissan plans to move its headquarters to Yokohama, Kanagawa, by 2010. Nissan North America relocated its headquarters from Gardena, California to Nashville, Tennessee, in July 2006. A new headquarters is being built in Franklin, Tennessee, completed in summer of 2008. Nissan is among the top three Asian rivals of the "big three" in the U.S., and is currently the third largest Japanese auto manufacturer. The Nissan VQ engines, of V6 configuration, have featured among Ward's 10 Best Engines for 12 straight years, since the award's inception. In February, 2007, the Tamil Nadu state government signed a memorandum of understanding (MoU) with auto manufacturing consortium, Mahindra-Renault-Nissan to set up a production unit at Oragadam in suburban Chennai The consortium, comprising Indian automaker Mahindra and Mahindra, Renault (France), and Nissan (Japan), will aim to manufacture nearly 50,000 tractors every year, in addition to cars, utility vehicles, and spare parts. The project is expected to increase Tamil Nadu’s Gross Domestic Product (GDP) by Rs18,000 crore annually while providing 41,000 jobs. It also produced several memorable sports cars, including the Datsun Fairlady 1500, 1600, and 2000 Roadsters, the Z-car, an affordable sports car originally introduced in 1969; and the Skyline GT-R, a powerful all-wheel-drive sports coupe. In 1985, Nissan created a tuning division, NISMO, for competition and performance development of such cars. Nismo's latest model is the 350Z LM. The recently launched mid-sized Nissan Navara truck has 175 bhp (130 Kw). 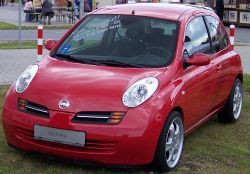 Nissan also sells a small range of keicars (Japanese small cars and micro-vans), mainly as a joint venture with other Japanese manufacturers like Suzuki or Mitsubishi. Nissan does not develop these cars. Nissan also has shared model development of Japan domestic cars with other manufacturers, particularly Mazda, Subaru, Suzuki, and Isuzu. Nissan began development of fuel-cell vehicles (FCVs) in 1996, and launched limited lease sales of the X-Trail FCV in Japan in fiscal year 2003. In 2002, Toyota and Nissan agreed to collaborate on hybrid technologies, and in 2004, Nissan unveiled the Altima hybrid prototype. On May 17, 2006, Nissan released the Atlas 20 hybrid truck in Japan. It released a Cabstar hybrid truck at the 2006 Hannover Fair. Renault-Nissan Motors is in the Advisory Council of the PHEV Research Center. Nissan is developing both a "parallel hybrid" system (akin to that found in the Toyota Prius) and a plug-in "series hybrid" similar to the Chevy Volt, though it favors the all-electric approach, because biofuel and ethanol are more expensive to produce than gasoline. ↑ Michael A. Cusumano, The Japanese Automobile Industry (Harvard University Press, 1985, ISBN 0674472551), 33. ↑ Cusumano, 28, 30, 33. ↑ 7.0 7.1 Nissan - a Japanese Multinational Automaker Corporate Lane. Retrieved November 24, 2015. ↑ Drive, Union … and demarcation. Retrieved May 20, 2008. ↑ Business Line E-Magazine, Mahindra-Renault-Nissan car facility near Chennai. Retrieved May 20, 2008. ↑ Green Car Congress, Nissan, Bosch in Talks on Hybrid Systems. Retrieved May 20, 2008. ↑ CNet News.com, Nissan bets on electric car, not biofuel. Retrieved May 20, 2008. Cusumano, Michael A. The Japanese Automobile Industry. Harvard University Press, 1985. ISBN 0674472551. Nissan. Nissan Jidōsha Kabushiki Kaisha. Tokyo: The Company, 1981. Smith, Donald C. Mapping the Corporate Mind: A Rhetorical Examination of Orientation at Nissan and the "Big Three". West Haven, CT: School of Business, University of New Haven, 1990. WestStart/CALSTART. Heavy-duty Hybrids 2003: Challenges and Opportunities. Pasadena, CA: WestStart/CALSTART, 2003. Yanarella, Ernest J., and William C. Green. The Politics of Industrial Recruitment: Japanese Automobile Investment and Economic Development in the American States. New York: Greenwood Press, 1990. ISBN 0313263590. This page was last modified on 5 December 2018, at 15:39.